TORONTO - September 28, 2017 - In recognition of the many achievements in driving and promoting women owned businesses in supplier diversity, both internally and externally, with a focus on mentorship and supplier development, Kiruba Sankar has been awarded the 2017 Corporate Leader of the Year Award by Women Business Enterprise Canada (WBE Canada). 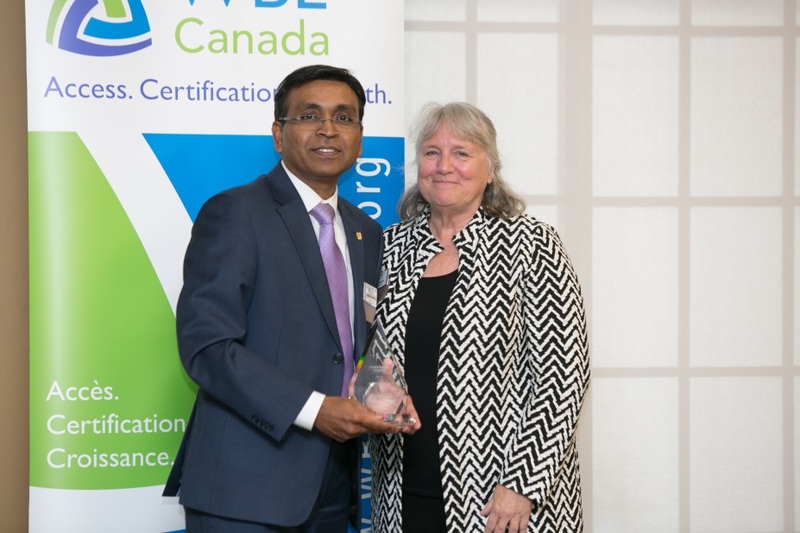 The award was presented to Mr. Sankar, Director of RBC Global Procurement at WBE Canada’s Annual National Conference and Matchmaker Innovate & Ignite on September 28, 2017. The event was an opportunity to celebrate the innovative talents and accomplishments of successful Women owned businesses, as well as the corporations that are championing diversity in their supplier base. The Corporate Leader of the Year Award recognizes Kiruba’s leadership in the successful launch of RBC’s Supplier Diversity (SD) program, developing internal relationships across various RBC business units and creating strategic alliances with internal stakeholders to drive the value of supplier diversity. He developed and rolled out Responsible Procurement training sessions to 220 RBC staff and applied a new Inclusive Supplier policy to ensure diverse suppliers compete in procurement sourcing processes at RBC. A long time mentor for supplier development, Kiruba led a multitude of training sessions for suppliers on how to respond to RFPs, how to do business with large corporations and coached them on perfecting their “elevator speech”. Kiruba is an avid sponsor of supplier diversity. As a regular corporate table host for marketplace meetings since 2014, he is a strong promoter of RBC’s supplier diversity program to expand opportunities for diverse suppliers. On an ongoing basis, Kiruba networks and nurtures relationships with new and existing diverse suppliers to constantly improve and enhance the supplier diversity ecosystem. Kiruba is a valuable brand ambassador for RBC and an ardent promoter of Supplier Diversity in Canada and abroad. This award recognizes an individual within the corporate membership of WBE Canada who has been a leader in implementing supplier diversity in Canada, acting as role model, advocate and champion in supporting women’s engagement in supplier diversity both within corporations and with women-owned businesses. More information about the award and WBE's work to advance economic opportunities for women through business development is available at www.wbecanada.org.